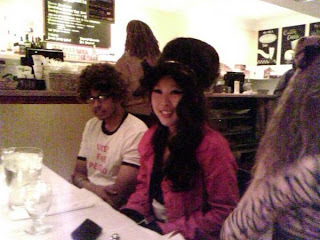 As some of my readers now, I dressed up as Amy Winehouse this year. The night didn't go exactly as planned, but it was a fun time nonetheless. First of all, there were SO many of us, it was hard to keep track of everyone. Second, the 7 train stopped working because of an injury at Willets Point. I wonder what happened that was so serious that they had to stop the whole train line. So, because of that we had to take two buses to get to a train. We were about two hours behind schedule, and we finally arrived at my friend's dorm at 8:30ish, where we were supposed to be at the parade by then. 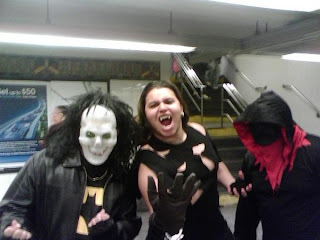 Jonathan & I finished dressing up in our costumes, and I bumped into my friend Eric & some of his friends. Then, we all made our way to the parade. At first I was told that the start was at 14st, but it ends up being at West 4th instead, and that to join we had to sign up at 4pm that day. So we were obviously not walking in it. Decided to watch it for a brief moment, but we couldn't get a good spot and we were hungry. We ate at Off to the Kitchen, which is a really nice place to eat. We all devoured our burgers and fries, except for Vikram who had ribs and mashed potatoes. Mmm. Went back to FIT, where my friend Alexis is dorming at. We hung out there for awhile then went home. Ah, Halloween was so great! I had so much fun! you forgot about me HAHA "BORAT"... HAHA! the hair and everything is like amy winehouse! 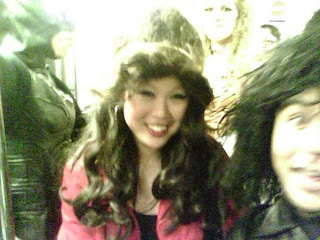 love the amy hair.. you did the costume amazing! ahah oh my god, i went dressed up as amy winehouse last year! i had to get rid of the transfer tattoos with nail polish remover... my beehive was no where near as impressive as yours though!